Infiniti has announced that they will be using Valeo’s Lane Departure Warning (LDW) system, which alerts drivers of an unintended movement of the vehicle out of a designated traffic lane. 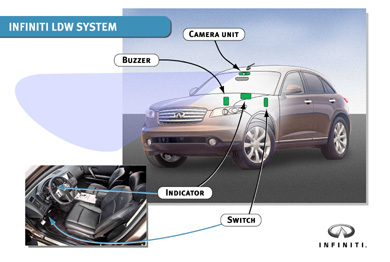 The new system, which utilizes a small camera, speed sensor, an indicator and an audible warning buzzer, will be offered this fall on 2005 models of Infiniti’s popular FX crossover sport utility vehicle – the first production application of LDW in North America. The LDW system will also be available on the next generation M45 performance luxury sedan, which is scheduled to go on sale in spring 2005 as a 2006 model. I hope it comes with a red scanner on the front, like Knight Rider’s KITT.